Plantains, also known as plátanos, are closely related cultivars of fruit or dessert banana. In general, they treated as vegetables in the kitchen much like fellow tropical produces such as potatoes, taro, breadfruit, yam, sweet potatoes, etc. Indeed, plátano are one of the staple sources of carbohydrates for larger populations in Asia, Oceania, Africa, and Central Americas for centuries served in main meals. As in the bananas, plantain too belongs to the Musaceae family. In their natural habitat, plátano was thought to have developed by hybridization of two wild species of Musaceae, Musa acuminata Colla (AA) and M. balbisiana Colla (BB), and consist of chromosomal triploid AAB genome. Plantain is quite different from dessert banana, being taller and larger and more drought tolerant. It is a perennial herbaceous plant that develops from the underground rhizome. Like bananas, it too flourishes well under tropical moisture-rich, humid, low-lying farmlands. At maturity, the rhizome gives rise to flower (inflorescence) that is carried up along its smooth, elongated, unbranched stem, piercing through the center of pseudo-stem, finally emerging out at the top in between its leafy clusters. The flower eventually develops into a bunch, consisting of 3 to 20 hands, with each group holding at least 5-10 fingers (fruits). 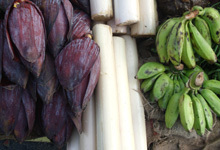 Plantain (right) with Inflorescence and tender banana stem in a market. Raw green plantains can only be eaten after cooking. Each fruit measures about 3 to 10 inches or more in length depending upon the cultivar type. They tend to have coarser external features with prominent edges and flat surface unlike smooth, rounded contour of dessert bananas. The flesh inside is rich in starch, with tiny edible black seeds concentrated at its core. Ripening process, however, enhances flavor and sweetness since much of its starch converts to sugar, similar to as in the case of fruit bananas but a lesser extent. Plantain flower (inflorescence), as well as its central stem (true-stem) too, are eaten in various kinds of recipes in South-Asian regions. Plantain (left) and banana. Photo courtesy: satanoid. Plantains of all varieties can be readily available in the USA supermarkets all around the year. At maturity, they generally harvested unripely and right away carried to the market for sale. Look for firm, mature, deep green, well-formed plantains that feel heavy in hand. Do not buy overripe, damaged, split fruits, as they stay poor. Once at home, store them open at room temperature for up to 4-5 days. Once ripe, plantains too, like bananas, are very fragile and show signs of decay in a short time span. Plantains are inedible raw and should be eaten only after cooked. To prepare, just wash the raw fruit in cold water and mop dry using paper cloth. Using a paring knife, trim either end. Then, cut the fruit into short lengths, split the skin superficially along the ridge and peel the skin gently away from the flesh to get firm flesh inside. Oftentimes, the whole fruit may be barbecued with its skin. Otherwise, it's peeled flesh may be cut into thin slices, and chunks, treated much like potatoes in many traditional African and West-Indian cuisine. Plátano can be delicious once cooked and usually served in main dishes as the chief carbohydrate source in many parts of the tropical regions. Tostones are other Caribbean specials. Photo courtesy: John Stephen. Plantains make delicious savory recipes, used in place of potatoes in grills, mashed, bake, or fries. In South-Indian Kerala state, plantain chips (vaazhakka upperi) seasoned with salt and pepper, is a popular snack. Tostones (twice fried plátano), prepared in a similar way, are again enjoyed as snacks in the Caribbean and Latin Americas. Its flower head (inflorescence) and interior icicle-white, tender stem (vazhai thandu in Malayalam) too are eaten in various kinds of recipes in South-Asian regions. Sopa de plátano is a popular Caribbean soup preparation that used green plátanos, garlic, cilantro, and cheese. Mashed plantain served with fried onions is a national breakfast dish of Dominican Republic. Mashed plátanos are served with rice, eggs, beans, poultry, fish, etc., in these regions. 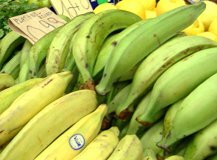 Being a close member of bananas, plantains also often can be a cause for local and systemic allergic reactions in some sensitive individuals. The fruit may elicit urticaria and may cause potentially severe gastrointestinal symptoms like nausea, vomiting, and diarrhea. "Oral allergy syndrome," is a condition in which eating banana family foods may cause itching and swelling of the mouth or throat within hours. Another kind of allergic reaction may be related to plant latex. (Medical disclaimer). Banana fruit nutrition facts and health benefits. <<-Back to Vegetables from Plantains nutrition. Visit here for an impressive list of vegetables with complete illustrations of their nutrition facts and health benefits.